There are times when a single word like brilliance or perfection is the only thing that comes to your mind, and it is enough to describe the entirety of your thoughts. But there are also times when you’re just dumbfounded, speechless because the marvel before you is too amazing to fathom. And then there are those “Maybach” times when all you do is smile and shake your head in disbelief. Its not speechlessness, because given the opportunity, you know you’d not stop speaking about it, its just that kind of a situation where nothing needs to be said. The car does the talking. I know its wanton, the brand itself is slated to shut down in a year. Maybach does stock what all those custom shops out there cannot do aftermarket, cannot signifying their inability to do so. So lets take a vow that when we can finally afford such delicious, over-the-top excellence, we as diehard gearheads will bring this brand back and the world will have Kings and Queens again. The incomparable entertainment experience that you can feel in a Maybach is enhanced by the output of 600 watts delivered through 21 almost invisible loudspeakers. Also included is the DRO system (Dynamic Range Optimisation) which uses a microphone to pick up variations in the ambient sound level inside the vehicle and corrects the audio output accordingly. The result is compelling, consistent sound reproduction which makes manual adjustment superﬂuous. Already legendary, the reclining rear seats with legrests and footrests, part of standard equipment in the Maybach 62 and the Maybach 62 S, offer a new dimension of travelling comfort in the Maybach saloons. The padded support deploys smoothly at the touch of a button to allow the changeover from the normal sitting position to a relaxing reclined position. Lavishly crafted in Grand nappa leather, the heated, integral seats with their gentle massage function and shoulder belts with automatic belt path adjustment ensure that, even on the longest trips, you can enjoy the characteristic beneﬁts of travelling in a Maybach: maximum relaxation combined with the best possible occupant protection. The technically advanced climatised seats ensure a particularly comfortable interior ambience regardless of the outside temperature. This happens thanks to three different levels of ventilation that allow you to decide how much air must circulate through the leather perforation of your seat. Wherever your journey takes you, you can always enjoy your own preferred temperature in your Maybach. Two climate-control systems with a total of four climate zones work independently in the front and rear of the passenger compartment. This means that different temperature, blower speed and air distribution settings can be programmed for each passenger. The intelligent ventilation system has a solar sensor which automatically makes the necessary temperature adjustments. 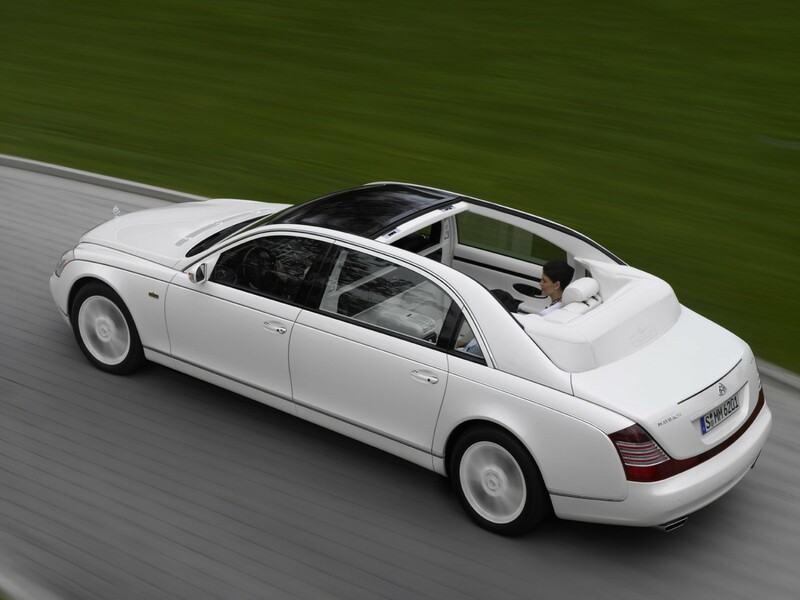 So even if it‘s particularly hot outside, you can be sure of keeping your cool aboard your Maybach. A dust ﬁlter, activated charcoal ﬁlter and air recirculation control ensure that you can breathe easy at all times. As individual as its owner: the Maybach philosophy extends to the particularly user-friendly seat adjustment function. Up to five memory buttons allow you to store the optimum, ergonomically correct seat settings for ﬁve different drivers. When someone else takes the wheel, the ideal settings for fore/aft position, height, backrest and cushion inclination, cushion length and head restraint height can be called up instantly. What‘s more, the positions of the steering wheel, both exterior mirrors and even the interior mirror are also stored. Spacious folding tables are available as optional extras for the two rear seats, except for Maybach 62 and Maybach 62 S, where they are part of the standard equipment. The design is inspired by the solutions used in the air travel industry and ensures you the maximum comfort during your journeys. The tables, made of fine trim elements and additionally covered with leather, are housed in special compartments on each side of the rear centre console and pulled out with a leather loop and then folded out. Once they are deployed, both their fore-and-aft position and angle of tilt can beadjusted continuously as required. No compromises where comfort is concerned – even when your Maybach is parked up. The auxiliary heater ensures that a pleasant interior climate is maintained, also during a long stopover. You can start the heather both with time programming at board computer and by remote control. 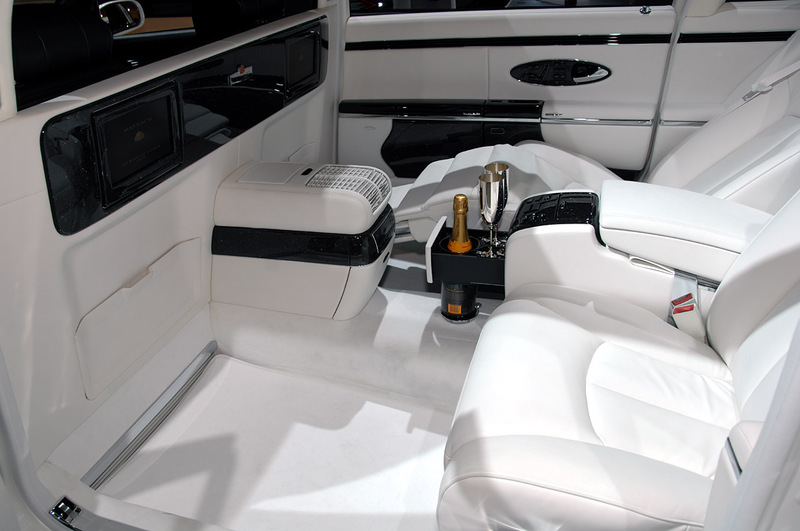 A refrigerated compartment (optional at no extra cost) can be fitted in the rear centre console to allow the occupants to enjoy perfectly chilled drinks aboard the Maybach models. This useful optional, with its electric compressor, has a 9.3-litre capacity and the temperature is controlled by a thermostat. The superb home-from-home ambience of the rear passenger compartment of the Maybach models is completed to perfection by the ﬁne silverware created by the most sophisticated manufacturing system known to man: the human hand. Passengers in the rear are kept informed about the vehicle’s progress by these stylish instruments, surrounded by fine wood elements. They make it possible to check the speed of the vehicle, the time and outside temperature at a glance. A distinctive element of style that remarks Maybach’s attention to details. This exquisite equipment detail – the only one of its kind anywhere in the world – represents a very special highlight indeed. At the touch of a button it produces a unique fragrant experience thanks to the use of sophisticated technology and high-quality perfume which discreetly, unobtrusively and gently stimulates the passengers’senses. At the heart of the system lies an internally illuminated glas sphere on the rear centre console, into which Maybach owners can insert a mouth-blown flacon containing a perfume they have personally selected. A compressor then directs a gentle flow of air into the transparent sphere, fanning the flacon’s perfume molecules into the vehicle interior. The chosen fragrance gently wafts into the passenger compartment within ten to twelve seconds. The flacon perfume atomiser can be activated either from the driver’s seat or by means of a button in the rear centre console, with an additional thumbwheel in the rear for sensitive aroma control. 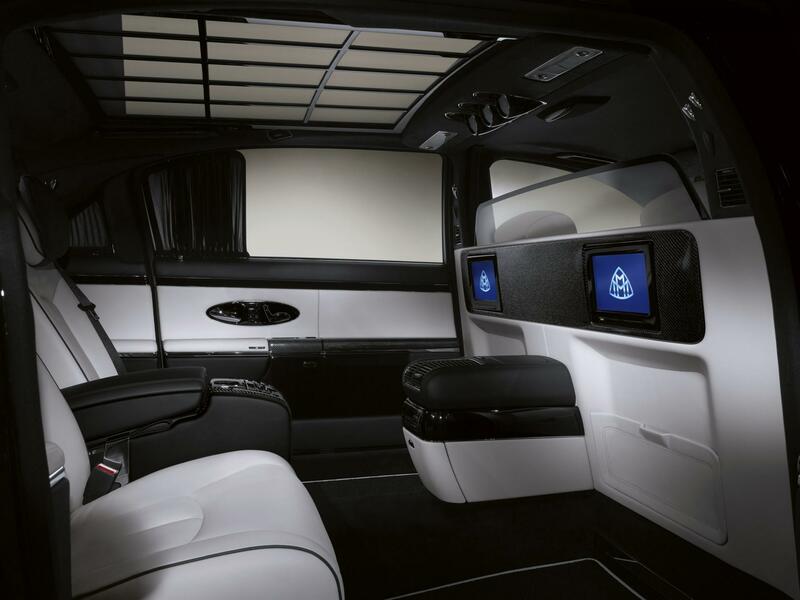 Even in standard speciﬁcation, a Maybach offers an advanced audio, video, telephone and navigation system. Situated at the front of the centre console, the COMAND control and display unit manages the functions of the radio, DVD, CD-changer, digital TV, front telephone and navigation system. The rear passengers can use the remote control to access the different audio and video sources as well as the navigation map. The two independently controlled rear screens are equipped with stylish headphones. Among the Rear Seat Entertainment System features: CD-changer, separate DVD Player, connections for MP3 Player and access for phone book. The entire Rear Seat Entertainment System can, of course, also be controlled easily by the driver. Keep in touch with the rest of the world: the WLAN router (available for certain countries only) developed within the context of the 2010 facelift keeps you connected while on the move. A Universal Portable Cell Phone Interface (UPCI) in the front and a Bluetooth handset in the rear are included as standard equipment, an additional hands-free system for mobile phone in rear is available as an optional extra.The telephone system is integrated in the front with LINGUATRONIC voice control, via multifunction steering wheel from the phone book and via the COMAND keypad or using the keypad on the handset itself or, in the rear, it is also possible to use the remote control to dial a number. Thanks to this device, you can communicate with the outside world at any time, without opening the doors or windows. Individuals on the outside of the vehicle can speak with people on the inside thanks to highly efficient microphones placed in the rearview mirrors via the intercom system and the external loudspeakers. The cost-free rear window curtains, as well as the optional electrically operated side window curtains, provide protection from the sun and prying eyes, as well as darkening the interior. The switches are situated in the rear centre console. Additional buttons in the front compartment are located on the front centre console. The optional electrotransparent partition makes it possible to separate the front and rear sections of the passenger compartment for complete privacy. Fitted in the area of the B-pillars, the partition features an electrically retractable upper glass section which can be switched between transparent and opaque modes at the touch of a button. Vehicles with a partition are automatically equipped with an electric intercom. Keep yourself in the picture: the overview camera for rear passengers, which is integrated in the partition on the driver’s side, transmits the view ahead of the vehicle to the cinema screen in the rear. This feature also plays an important safety role as it allows you to monitor what is happening ahead of your vehicle without compromising your privacy in any way. You can unlock the doors of your Maybach without having to operate the key. Simply carrying it with you is all that is required. As well as simplifying the unlocking process signiﬁcantly, the KEYLESS-GO electronics allow you to start the engine without having to use the ignition lock. Instead, a press of the button on the selector lever is all it takes – and then the pleasure of the Maybach driving experience can begin. The Maybach V12 is a petrol engine with a cylinder angle of 60°. It is available in two different displacements and power variants for your Maybach. The cylinder angle of 60° is ideally suited to the vibration characteristics of a V12 petrol engine. The engine is designed for low wear, economical operation, high levels of comfort and smoothness, as well as impressive power delivery. The engine design is characterised by three valves per cylinder, initialised dual ignition, a rigid aluminium crankcase in lightweight design and a crankshaft with grey cast-iron inserts in the main bearings. Two turbochargers with waste gate control at the cylinder banks ensure outstanding responsiveness combined with maximum torque delivery already at low engine speeds. With the Maybach facelift 2010, all the impressively powerful engines run with lower fuel consumption and CO2 emissions, thanks to new control and diagnostic sensors per exhaust tract and the optimised engine control unit software. hand-assembled by AMG. A single technician is responsible for his assigned engine and puts his signature on the characteristic model plate, which is attached to the cover of the V12 biturbo; a guarantee of the greatest care and highest quality. Since the 2010 facelit, Maybach’s leading position in the high-end luxury segment has been not only extended regarding rated output; Maybach could also set a new benchmark concerning fuel consumption and CO2 emissions. Fuel consumption (combined) 15,8-15,0 l/100 km, CO2 emissions (combined) 368-350 g/km. The in-house made 5-speed automatic transmission has 2 shift programs and takes into account a series of driving dynamics parameters as well as the individual driving style when selecting the gears.In addition, this transmission features a torque converter lockup clutch, which can also be engaged in the lower partial load and speed range. Rapid adaptation of the transmission to the prevailing situation is made possible by continuous electronic comparison of different influencing factors such as rolling resistance (load, gradient) or driver reactions (accelerator movement, frequency of manual gearshifts, the vehicle’s longitudinal or lateral acceleration). A program selector button allows the driver to choose between the “S” (Standard) and “C” (Comfort) shift programs. For better control when starting, “C” mode features second-gear start and a higher reverse gear. Further features include a mechanical lock which prevents the vehicle from rolling away when the selector lever is in position “P”, as well as a preventive measure against unauthorised operation of the selector lever.